For those of you who want to make a felt birthday cake with parts you can change, here it is! Where to begin, though? This wasn’t a hard project, but it took a lot of little bits and pieces to come together. I’ll start with the tutorial for the cake and frosting and then do the cake decorations in one tutorial on a different day. The foam is heavy and I found it difficult to cut even using an electric knife. It wasn’t very uniform and just looked gross to me. I think I was on the right track with the fabric frosting, but it didn’t really look very pretty (you could see the foam through it) and it was really difficult to make everything line up. I cringed every time my girls brought it out. After a great deal of thinking, I realized that a hat box (or a round box) with a lid would be perfect as the cake part. It is sturdy, it holds its shape pretty well and—the best part—things can be stored inside of it. I used a large round box from JoAnn’s. They are available in lots of sizes, so use whatever size suits you best, or make them in several sizes so you can have layers. This is also an excellent use for recycling a sturdy round box! Paint the edge of the lid a cake color. I started with cream for vanilla, but it was too light to show the frosting filling, so I went with a bright yellow—lemon. I painted the edge and then set it on the box to dry. The first “here’s what NOT to do” part: I did the next part by sewing a felt strip onto felt, but it made the lid too tight. I will be purchasing another box (boo!) so I can paint the sides and then hot glue on 1/2 wide white ribbon for the frosting between the layers. Also, you want to glue the ribbon on while you have the lid on the box so you can eyeball the center which is slightly different than the center with the lid off. This is the basic idea of what you want to have when you are done, though. When someone peeks under the frosting, they will see more delicious cake and not a plain box! This part is not necessary, but I like it a lot! You can barely see it through the felt frosting and it makes the cake look more real. To make the top magnetic, cut a piece of ductwork (which is thinner than sheet metal) to fit on top of the lid. I found mine in the heating and A/C section of Lowes and just bought the smallest, cheapest flat piece available. It was about 18” x 36” and cost $5.44. There is a lot left over for other projects! Trace around the top of the box (not the lid) with a Sharpie marker being careful to stay close to the box and not squishing the box or distorting the shape as you hold it. Cut out the circle about 1/4 inch inside of the traced line using the tin snips. I eyeballed this line and ended up cutting again and again to get it small enough, but it worked fine and didn’t take long. Incidently, tin snips are around $10 at the hardware store and I have used them for a lot of projects. If you don’t have any, it isn’t such a bad thing to have on hand! Wrap the edge all around in electrical tape. Electrical tape is very flexible and will easily stretch around the curves. You can stick it along the whole circle with about 1/2 on the top and 1/2 on the bottom stretching it around the curves as you move around the circle. This will help protect children from sharp edges. Glue the metal to the top of the box (no picture—sorry) using E6000. Once it is in place, flip the lid over so the metal is down with the lid on top of it and place a very heavy object (I used a stack of glass mixing bowls) inside the lid to flatten the lid against the metal. The lids tend to sink in towards the box and this will help the metal to stick properly and to flatten the top of the box a bit. You may have to clamp it together somehow to hold it until the glue dries. Turn the box lid upside down and trace around it on a piece of newsprint or tissue paper. Again, be sure to trace right next to the lid and do not distort the shape of the lid. After tracing the original shape (pink in the picture), use a ruler to mark 3/8 of an inch larger by placing dots around the pink circle. Connect the dots (black line) and cut out on that line. Try to be as accurate as possible. Use the pattern you just made to cut the felt for the top of the frosting section. Cut a strip that is as wide as the width of the side of your box plus 1/4 inch. Mine was 5 inches wide so my strip was 5 1/4 inches wide. It should be as long as the circumference of your box plus a couple of inches. I just cut the entire length of my felt and cut off the excess at the end of the sewing part. Cut another strip 1” wide and the length of the felt. For each color/flavor of frosting you should have one circle, one wide strip and one narrow strip. To sew, place the wide strip along the edge of the circle. Sew in place using a scant 1/4 inch seam allowance gently pulling the strip along the curve of the circle as you sew it. When you get to the end, overlap the strip about an inch. Backstitch in place. Cut off excess strip piece. IMPORTANT: Place frosting over the box with the lid in place and adjust the fit. Turn the box sideways and trim any excess edges on the bottom edge of the frosting piece. Be sure the frosting lines up with the bottom of the box all of the way around so the fancy frosting line is even when it is sewn in place. There are two ways to sew the fancy frosting. 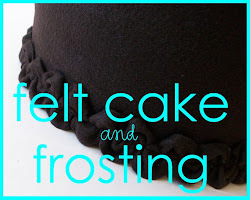 First, you can gather the narrow strip using a gathering stitch and pulling it to the desired “ruffle-y-ness.” Then, sew it in place along the bottom edge of the frosting piece. Ruching is a gathering stitch, but instead of sewing in a straight line, sew in a zig zag or scallop line. The width of your zig zag or scallop will change the look a little, so you may want to practice first. 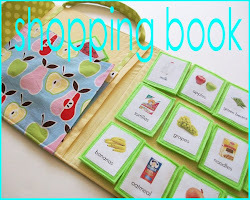 You will also want to mark your fabric in equal amounts to ruche evenly. It takes longer than standard gathering, but what a fun difference. You do not need to fold your strip since neither side will fray. I did not mark my strip, actually, but it turned out pretty evenly because I zig zagged to the same place on each side of the sewing machine. It sounds crazy, but it worked out just fine. Pull the threads to gather the felt. Adjust the gathers so the scallops are evenly spaced. Lay the fancy frosting along the bottom edge of the frost piece so the very tops of the scallops are hanging off of the frosting piece.Sew in place along the center of the felt. The finished piece showed up best in chocolate, so here you go! Now, you can take the frosting piece off and on easily change to a different flavor of frosting. Thanks to the sturdy box underneath, the frosting is neat and smooth without the pillow-lumpy look that the foam tends to get. The frosting pieces you aren’t using can be stored inside the cake where they won’t (cross your fingers) get lost! It looks so real, that my three-year-old walked into the kitchen, saw this on the counter, and with her eyes wide (wondering how she missed out on the fact that I baked and frosted a cake!! ), asked me for some cake to eat! I couldn’t help it, I laughed!! Doesn’t it make you want a lick of that rich and creamy chocolate frosting? And, don’t forget the yummy cake inside! Come back later this week for the cake decorating tutorial! 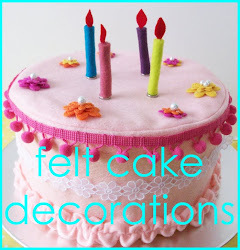 I’ll show you how to make some quick and easy embellishments for your felt cake! The icing is gorgeous. Great job and great tutorial! Genious!!! I love the cake underneath the frosting. I can't wait to see more! BTW - thanks so much for becoming a follower. I'll be following you too! What a fun cake and it came out so beautiful. Thanks for sharing your cake making tutorial with us. I featured this today on my facebook page! WOW!! This is awesome. I can't wait to see the rest. I am SOOOO in love with this project and tutorial! Way to go! 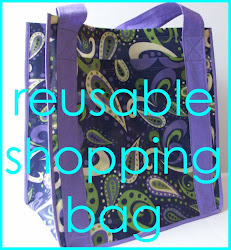 I'm featuring this tonight on Topsy Turvy Tuesday's! DONE! http://knifties.blogspot.com/2011/02/hat-box-cake-project.html Thanks for the great tutorial! my little girl loves it! A little late to be adding a comment, but was surfing the net for tutorials and came across your blog. LOVE YOUR CAKE!!!!! Use an 'industrial' Utility/Box Knife. The blades are heavy duty and extended to 3". Most hardware stores carry them and they are very reasonably priced. a) Starting on the pattern line b)hold the knife in an 'straight' upright position 3) with the blade completely extended and 4)using an up 'n down sawing moton, cut out the circle and/or curve. Upon completion you will have a bit of foam attached but with your fingers carefully separate the foam and finish trimming. If done properly you will have and uniform and nearly smooth cut edge. FOR CUTTING STRAIGHT LINES and/or EDGES: An Electric Knife works the best. Straight edges turn out 'as smooth as butter'. GOOD LUCK and HAPPY CAFTING.